Lebogang Mokwena only learnt to ride a bicycle at the age of 30. Lebogang Mokwena / Beautiful News. When she did, it changed her life. Her newfound skills opened up a world of freedom and accessibility. But many miss out on the chance, having never owned a bicycle. “Not everyone’s childhood is the same,” Mokwena says. So she’s made it her mission to level the playing field by offering mobility to others. It all begins with teaching people how to ride. While living in New York, Mokwena began cycling with an organisation that provides free lessons. She felt liberated and vowed to bring the initiative back to South Africa. “I wanted adults to discover dreams they never thought they’d accomplish,” she says. “The fear of what people will say is what holds most people back.” Based in Cape Town, her classes are intimate, thoughtfully designed, and include bicycles, helmets, and water. The process is explained from start to finish. Mokwena begins by removing the pedals, allowing riders to scoot around until they find their balance. Once they’re set, the real fun begins. Squeals of delight punctuate the occasional crash or fall. The once two-wheeled symbol of inability turns into a vehicle of strength. “There’s something inherently sustainable about it,” Mokwena says. 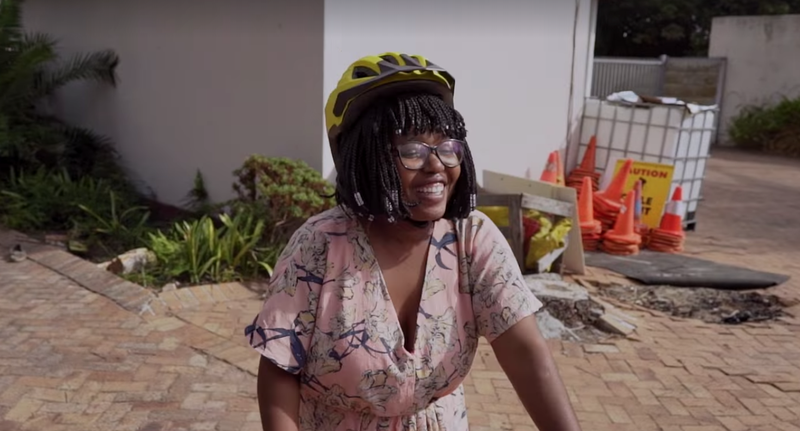 “It transports you and is healthy, not just for our bodies but for the environment.” Through her programme, Learn2Cycle, Mokwena is inspiring confidence, equality, and clean living. Riding under the warm sun, tasting the breeze, we all experience the same freedom. “There’s no age limit to learning,” Mokwena says. When we’re empowered, we can ride on.